Kicking off what I hope will be the triumphant return of Zombie Wednesdays here at Aim for the Head, I bring to you a classic tale of boy meets girls. Or zombie eats girl… or, well, he doesn’t eat her. Not on camera anyway, that would get much higher than a PG-13 rating. I’m talking about Warm Bodies. Based on the book, it is the story of Romeo and Juliette set in a post-zombie-apocalyptic world and casting Romeo as a zombie. And as dumb as that sounds – like Twilight levels of dumb – surprisingly it works. I don’t want to spoil the film, so I’ll stop talking in specifics. Instead, I’ll just say that you’ve never seen a zombie movie like this before, in a manner similar to how you’d never seen one like Shaun of the Dead before, but not in remotely the same way. 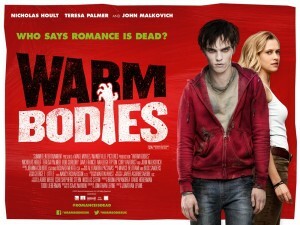 Warm Bodies leans far more toward a typical romantic comedy than it does a zombie horror film, but that’s okay – as I’ve said many times on this very blog, zombies are best as a setting for human drama. The biggest shift you have to make in the world crafted here is that there are two kinds of zombies, corpses and skeletons. The corpses shamble around looking for brains and in their “downtime” they shuffle through almost normal human stuff in normal human places. The skeletons have given up all pretense of humanity, they hunt food with purpose. And like with many zombie movies, the humans are divided into two groups as well, though they don’t get cute names to group them under. One group is content to hide behind a wall and scrounge their survival from the ruins of pre-zombie life, while the other group wants to get back out there and live again. Anyway… is this the best zombie movie ever? My wife thinks so. I disagree, but I do think this movie is very good and I like the message it delivers in both its subtle and completely unsubtle ways. Most movies about zombies wind up being about hope, or crushing hope depending on how it ends, with a side helping of “people are the real monsters”, but Warm Bodies brings along a message of connection, about interacting with people and looking them in the eye. It isn’t the best zombie movie ever, in my opinion, but it is well worth watching. They put a brilliant spin to the whole zombie apocalypse thing, I think it’ll be great!